The story of Fire Container begun in 2003 when initial theoretical work on the concept and basic elements of the container and harness took place. All the structures of skydiving containers and harnesses in the world were classified at that stage. In 2004, initial and comparative analysis was completed and we defined the structure of our future container, soon after that we began experimenting with a number of elements of the construction. In winter 2005 we proceeded to manufacturing of our first model, in autumn 2005 the first prototype of Fire was completed, thus the first stage was over. At that time, in autumn 2005, we proceeded to the initial stage of tests. We chose the American testing program TSO-С23d, which is one of the strictest programs for flight trials. Maximum allowed weight for the system was 136 kg (300 lbs), maximum alowed speed – 309 km/h (170 knots). Thereafter, in accordance with the requirements of the testing program, maximum testing weight was 165 kg (coefficient 1,2), and maximum testing speed was 370 km/h (coefficient 1,2). From autumn 2005 to summer 2006 30 drops were executed with mannequins and weights from 25 to 165 kg at speeds of 120 – 370 km/h. Reserve Chute opening during a total malfunction of main chute was tested – the ring of the reserve was being pulled out with a ripcord attached to the aircraft. 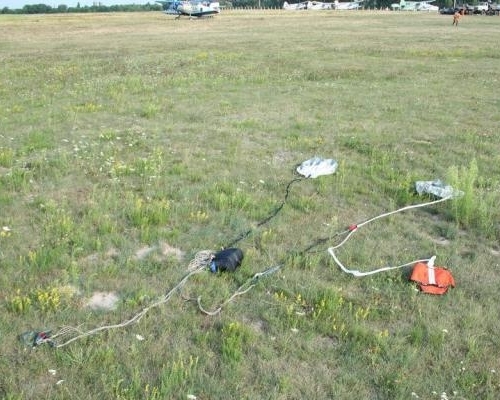 Among the tests we executed a mannequin drop with static line deployment of the chute at a speed of 210 km/h with no slider, with immediate deployment the estimated acceleration was more than 30G. The harness was not damaged within the experiment and has been in use up to now. 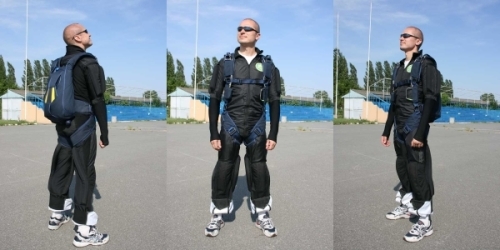 Within the entire period of strength tests no failures, breakages of damages of skydiving gear were registered. In spring 2006 Airtec certification was obtained that provided Cypres AAD installation. In September 2008 we initiated the second procedure of certification to register all the modifications that had been made. In spring 2006 SWS Company (at that time called SkyCentre) was accepted to PIA – Parachute Industry Association. After the stage of strength tests with mannequins we switched to the stage of functional tests – jumps with the parachute system under testing were executed by test jumper Alexey Sharadkin. 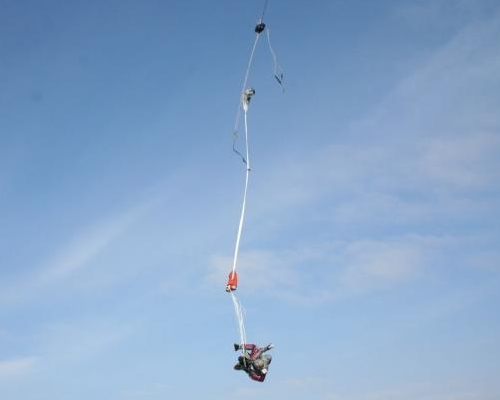 The tests were conducted in summer and autumn 2006, 2 jumps at DZ “Chaika” and 25 jumps at DZ «Mayskoye» were made. Within the tests all the modes of the parachute system functioning were tested, such as: total malfunction of Main with the Reserve deployment immediately after drop off, with the Reserve deployment at the moment of minimum airspeed, at the moment of terminal velocity, the Reserve deployment after Main’s cutaway: immediately after cutaway, after 5 seconds of free-fall, after the terminal velocity had been reached. Within the entire period of functional tests no failures, tears of damage of parachute gear was registered. In November 2006 the strength tests were conducted on the base of the testing laboratory of the Research Institute of Fiber Treatment. 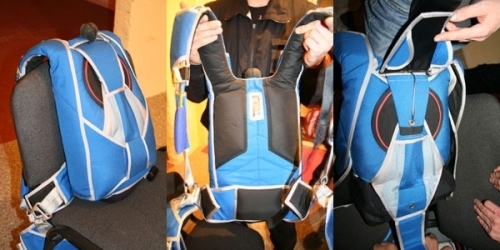 The junctions of the harness were strength-tested in all possible ways and directions of loading. The tests thus proved that the theoretical values of strength that had been stated in ”Parachute Manual” guidelines, books 1 and 2, fully complied with the actual values of the tested models. Those tests proved the safety of the operational limitations set by us, demonstrating that the strength of the structure was much higher than the required parameters of strength. Soon after that we decided to start operational test of Fire container, the estimated period was equal to 1 year or to 1000 jumps. The operational test began in autumn 2006 and continued until spring 2008. In total 10 containers were manufactured within the operational tests, and the jumps were executed by high professionals, specially trained sportsmen. Within the operational tests slight structural modifications were introduced to the container to eliminate various decorative defects, to reduce wear,and to extend the lifetime of the parachute system. More than 1200 parachute jumps were done within the tests among which the only one malfunction was registered – it was linetwist on Velocity 84, after the incident the Main chute was cut away, and the sportsman successfully landed under his Reserve. In autumn 2007 the next stage of tests begun. The purpose of these tests was to register all the modifications that had been made within the operational test period of Fire container, as well as to implement the modifications required for further installation of Direct Reserve Deployment (DRD) – the system that allows releasing and opening the Reserve by the cuted away Main. Collins Lanyard system was tested too – this is the system of automatic cutaway of the second riser if the riser with RSL handle was torn or broken (or premarture released). The stage of tests began in autumn 2007 at the DZs ‘Mayskoye’ and ‘Borodyanka’ and continued in spring 2008 at DZ ‘Mayskoe’. In total there were 34 jumps done. The last jump of the test was to check the Reserve opening after Cypres AAD activation, the jump was executed by an experienced sportsman. Within the entire period of tests no failures, tears or damage to parachute equipment was registered. Taking into consideration successful results of strength and functional tests, strength tests at test benches, successful completion of additional tests, and the results of operational testing, on the 2nd of April 2008 Fire Containers were approved for serial manufacturing.